German playwright and humorist; born at Breslau Feb. 23, 1820; died at Berlin Aug. 21, 1872. His infancy and early childhood were spent in a home of comfort and culture; but when he was only seven years old his father died, leaving the family without any means of support, and Kalisch was compelled to add to the family resources by entering the employment of a dealer in small wares, who later on entrusted him with the management of a branch establishment in Ratibor. In 1843 he returned to Breslau, and in Oct., 1844, went to Paris, where he gradually became on terms of intimacy with a group of poets and socialists that included Heine, Herwegh, Karl Grün, Proudhon, Karl Marx, and Albert Wolff. He made at Leipsic his first attempts as a farce writer with his "Die Proletarier" and "Auf der Eisenbahn." Kalisch was still bound to a mercantile career, however, as neither literature nor the stage had yet made a place for him; and so in 1846 he found his way to Berlin and took another position as salesman. He found time to continue his literary efforts by writing a number of the peculiar verses which, under the name of "Couplets," were first employed by him, and which he afterward utilized with great success in his stage pieces. He also tried his hand at adaptation from the French, the little farce "Ein Billet von Jenny Lind" being produced at the sum mer theater at Schönberg, near Berlin; the principal result of this was that it secured for him an invitation to write for the Königsstädter Theater, where his "Herr Karoline" was produced, and later (Dec. 23, 1847) his "Einmal Hunderttausend Thaler," which at once achieved a veritable triumph. There followed in quick succession. "Berlin bei Nacht," "Junger Zunder, Alter Plunder," "Aurora im Oel," "Münchhausen," "Peschke," "Ein Gebildeter Hausknecht," "Der Aktienbudiker," "Berlin, Wie es Weint und Lacht," "Einer von Unsere Leut," "Berlin Wird Weltstadt," "Die Berliner in Wien," "Der Goldonkel," and "Musikalische Unterhaltung." Very soon he practically dominated the German farce stage of his time. At the old Wallner Theater in Berlin and in the great comedy houses throughout Germany there were years when none but his pieces were produced, some of them having runs of hundreds of performances. Nor was it in Germany alone that his plays became famous, for by adaptation and translation they were produced throughout the world. A collection of his celebrated "Couplets" was produced under the title "Berliner Leierkasten" (3 vols., Berlin, 1857; 5th ed., 1862; new series, 1863 and 1866), while a number of his farces were issued as "Berliner Volksbühne" (4 vols., ib. 1864) and "Lustige Werke" (3 parts, ib. 1870). 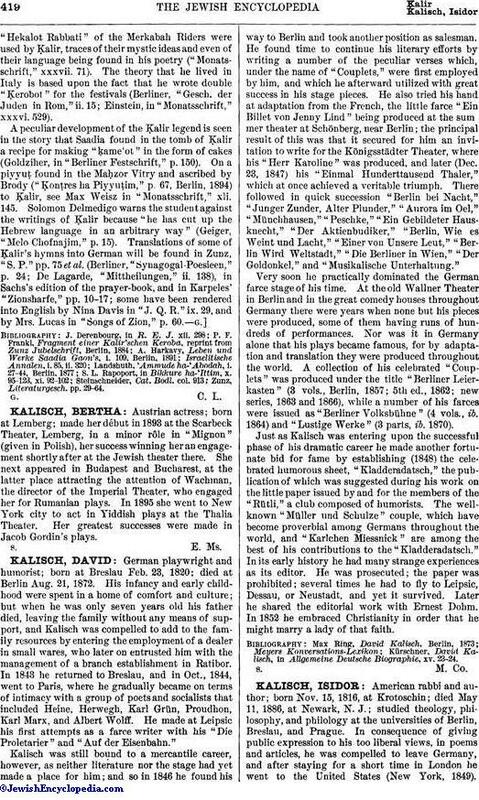 Just as Kalisch was entering upon the successful phase of his dramatic career he made another fortunate bid for fame by establishing (1848) the celebrated humorous sheet, "Kladderadatsch," the publication of which was suggested during his work on the little paper issued by and for the members of the "Rütli," a club composed of humorists. The wellknown "Müller und Schulze" couple, which have become proverbial among Germans throughout the world, and "Karlchen Miessnick" are among the best of his contributions to the "Kladderadatsch." In its early history he had many strange experiences, as its editor. He was prosecuted; the paper was prohibited; several times he had to fly to Leipsic, Dessau, or Neustadt, and yet it survived. Later he shared the editorial work with Ernest Dohm. In 1852 he embraced Christianity in order that he might marry a lady of that faith. Kürschner, David Kalisch, in Allgemeine Deutsche Biographie, xv. 23-24.